Look who’s hit the college football big time! For the first time in almost 40 years, the Kent State Golden Flashes have cracked the Associated Press ranking, coming in at No. 25 in the latest rankings. We can honestly say we never thought we would see this day. 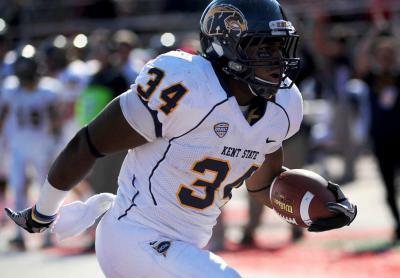 “We are very excited to be in the Top 25, but there are still many more goals to be accomplished,” said Kent State head coach Darrell Hazell, who has guided the Golden Flashes to an eight-game winning streak, the longest in school history. Kent State is currently 9-1 overall and sitting all alone at the top of the MAC’s East Division with a 6-0 record (the nine wins are tied for the most in school history). The Golden Flashes haven’t won a division championship since the MAC split and their only MAC title came in 1972 – the same year as their last bowl game appearance. They have a chance to change all that on Saturday when they travel to Bowling Green for what is (for now) unquestionably the biggest football game in school history. Beat the Falcons on the road and Kent will punch its ticket to the MAC Championship Game in Detroit on Nov. 30. The Golden Flashes finally earned their national ranking after a dominant performance against Miami (Ohio), beating the Redhawks, 48-32. Kent rolled up 546 yards of offense, with 399 of those yards coming on the ground. They were once again lead by the dynamic duo of Dri Archer (151 yards rushing, two rushing touchdowns and a receiving touchdown) and Trayion Durham (172 rushing yards, two touchdowns). Durham, with 1,059 yards (a 5.0 yard per carry average), and Archer, with 1,043 yards (a 9.7 per carry average) are the first backs in school history to surpass 1,000 yards in the same season. Archer’s 19 total touchdowns are also a single-season record. Kent State, which has won 13 of its last 15 games dating back to last season, now must avoid a letdown against the Falcons, who are 7-3 overall and 5-1 in the MAC. We were a little worried about that after they beat Rutgers a few weeks back, but after solid wins over Akron and Miami, it’s clear that Hazell is keeping the team focused.